The gardens are ripe. There's food of all sorts coming in every day, to be eaten, dehydrated, processed into sauce, frozen, stored. Tomatoes! 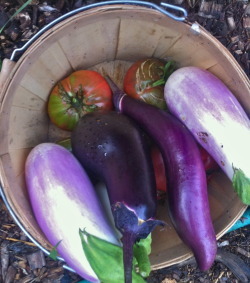 Eggplants! String beans, haricot vert, edamame, yard-long red noodle beans. Dried beans--kidney, cannellini, black turtle, and more. Tomatillos, husk cherries, zucchini. Hundreds of heads of garlic are in, cleaned, and socked away in 5 lb bags. Onions and spring potatoes are drying on racks. The barn is full. And there's so much more to come in! I spent the last week away from the farm--first to Boston, to celebrate a friend's 40th birthday. Then, to Amherst, to attend the New England Organic Farming Association (NOFA) conference. Anne and I stopped in to visit an old friend of mine, who now lives near Amherst in a rural area, on a gorgeous bit of land that's been well cultivated and tended. Then down to Washington DC, to meet my new niece, and to help out my sister and her husband for a few days. And then to Philly, on my way back, to see one of my oldest friends, who's recently moved to a new home. A bit of a whirlwind tour. I would have loved to spend a month with them all, to get to know their children better. Milo, who's cutting teeth and toddling about. Elias, the builder, and Rosa, his sweet sister. My own niece, Isabel, working to hold her head up by herself, and intent on observing everything around her. And Eli, who's has grown so fast I can barely believe it. So many wonderful children to love!